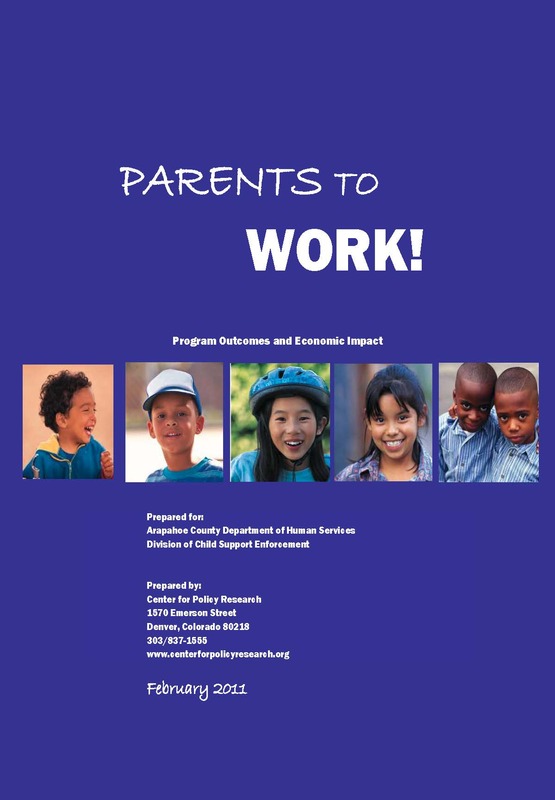 Parents to Work, a program to secure jobs for unemployed and underemployed noncustodial parents (NCPs) with open child support cases involved the Arapahoe Division of Child Support Enforcement (CSE), Arapahoe/Douglas Workforce Center (A/D Works), and the Arapahoe District Court/18th Judicial District. Conducted from August 2008 to March 2010, Parents to Work involved: specialized, co-located child support and workforce personnel; identification of nonpaying obligors by child support workers, court records and staff outreach using an automated listing of potentially eligible cases; referrals of these obligors for on-the-spot screening and assessment by workforce personnel; a customized menu of employment-focused services and access to supportive services including transportation assistance; and communication between project personnel and the magistrate who hears child support matters for the county. All eligible cases were randomly assigned to an experimental and comparison group consisting of 601 and 349 NCPs, respectively. The evaluation data came from intake forms and assessments completed by project staff, information on child support payments drawn from the automated system, and employer-reported wage data for the Unemployment Insurance (UI) system supplied to the Colorado Department of Labor and Employment.